BILLINGS, Mont. — The Trump administration on Friday finalized changes to sweeping federal land use plans for Western States to ease energy industry restrictions in a way officials say will protect a struggling bird species. 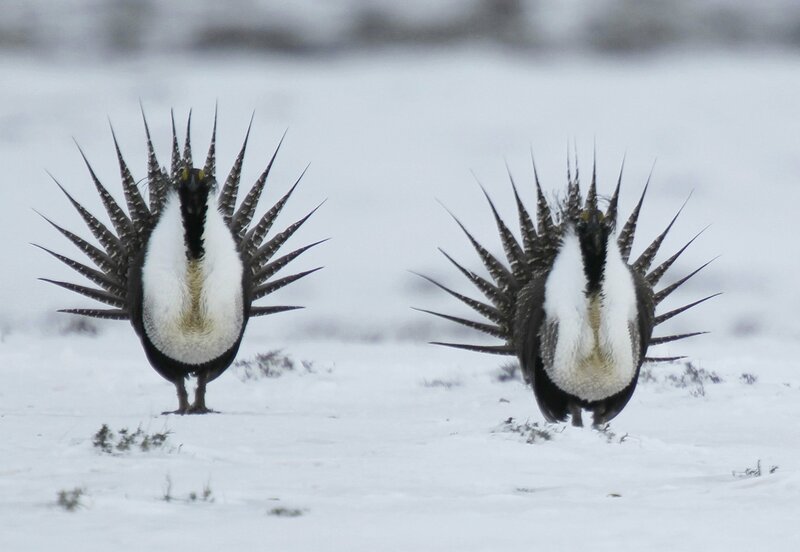 The changes by the U.S. Bureau of Land Management will guide future efforts to conserve greater sage grouse, ground-dwelling birds that range across portions of 11 Western states. Environmentalists have said the widely-anticipated move will undermine protections for the chicken-sized bird. They would allow more oil and gas drilling and other activities on grouse habitat. But the administration secured key backing from Democratic and Republican governors in affected states. The birds are known for an elaborate mating ritual in which males puff out a yellow air sac in their chest as they strut around breeding grounds known as leks. Their numbers have plummeted due to energy development, disease and other factors. Opponents are expected to challenge the changes in court. Brian Rutledge with the Audubon Society said the revisions will make it harder to stop the long-term decline of sage grouse by giving oil and gas companies access to crucial grouse habitat. “It’s a free for all, based on prioritizing fossil fuel extraction over any other use of the federal landscape,” Rutledge said. U.S. Bureau of Land Management Acting Director Brian Steed told The Associated Press the changes address concerns aired by state officials that previous policies governing millions of acres of federal land were too restrictive. Those policies were largely enacted under former President Barack Obama. They were memorialized in a 2015 partnership between Western states and the federal government. Steed said the broad revisions to the Obama-era plans were meant to move beyond what he called a “one-size-fits-all” approach under the old rules. He said the changes give more flexibility to land managers and states concerned about balancing economic development with protections for the bird. The birds once numbered in the millions but the most recent estimates from the U.S. Fish and Wildlife Service places the population at between 200,000 to 500,000. The 2015 plans capped years of negotiations and were intended to prevent grouse from being listed as a threatened or endangered species. Such a designation could have brought severe limitations on grazing, energy development and other activities across the bird’s range, which covers some 270,000 square miles (700,000 square kilometers). Under President Donald Trump, Interior Department officials have vowed to lift obstacles to drilling. Grouse protections have long been viewed by the energy industry as an obstacle to development. The new plans were expected to remove the most protective habitat designations for about 13,000 square miles (34,000 square kilometers) of public land. Those areas, considered essential to the species’ survival, were a centerpiece of the Obama policy. The Trump administration also would drop some requirements to prioritize leasing for oil and gas outside sage grouse habitat and allow for more waivers for drilling. In Wyoming, one of the most important remaining strongholds for the species, Republican Gov. Mark Gordon said the changes would “provide predictability” for economic development while conserving grouse. Colorado Gov. Jared Polis also expressed satisfaction with the outcome. “We look forward to working with the BLM and our local communities to move important conservation measures forward to protect greater sage grouse in Colorado,” Polis said in a statement.